Holding the fort in the northern land of Yishun is our Captain Mohamed Faizal Bin Ali, 43. 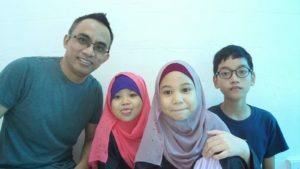 “After I left teaching in mainstream schools, with years of experience as a teacher and a discipline master, it was a smooth transition when I joined Hijrah’s Little Sahaabah After School Adventure Club. Working with a new management team made up of sisters and teachers in Hijrah is like working with a new extended family. I feel blessed being around our “Little Sahaabah” and to teach them not only Quran but also the values of a good Muslim and a good person. I stayed in teaching because of the adrenaline rush from the tragic, the weird and the joyous, and because of their wonderful unpredictability.